In the course of the development of the Damasko manufactured calibre A35, for which also a new winding concept was worked out, the familiar “double eccentric winding system” was created. In order to be able to produce this in an optimal way, both from a technical point of view as well as in terms of quality, Damasko decided to produce all important key components themselves. In addition to the bearing of the winding device (see section “Micro ball bearing"), the focus of attention now moved onto fabrication of the winding mass, the so-called rotor. Today, after establishing the production and assembly process, the company is in the position to manufacture all the rotors that they use. In addition to that, this fabrication was expanded further due to increased enquiries by other watchmakers, so that they can manufacture rotors for all current automatic calibres. 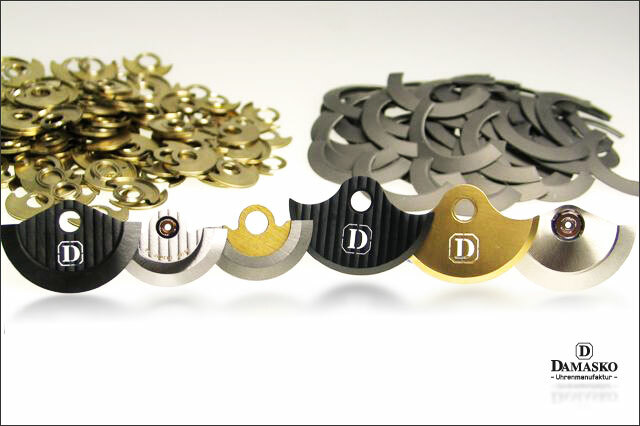 At this point, Damasko benefits from the fact that the rotors can be equipped either with a standard ball bearing or with their own micro ball bearing. Special models or even new developments can be realised within a short time, whether of one piece or multipart, e.g. with hard metal segment. Moreover, surface refinements such as perlage, Geneva Stripes or the like can be realised. Besides, any imaginable milling or laser engraving is possible. 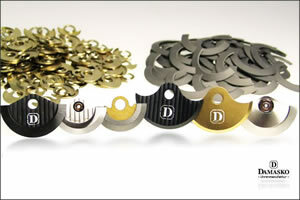 Even such surface refinements as gold-plating, rhodanizing or PVD-coating do not represent a problem.